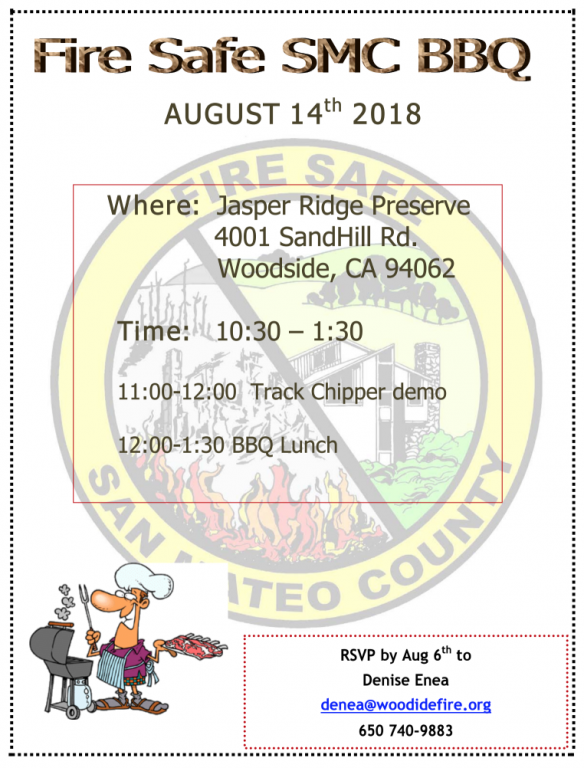 Join us for a BBQ on Wednesday, August 14th from 10:30 am to 1:30 pm at Jasper Ridge Preserve in Portola Valley. You know it’s the middle of summer when you see your annual invite to the FIRE SAFE SMC BBQ at Jasper Ridge. This is a great opportunity to get better acquainted with some of SMC’s movers and shakers in the fire management arena. We have all worked hard this year with various large and small hazardous fuel management projects so come brag about your successes. We will have our latest piece of Fire Safe equipment on site to show you. The BBQ is the real deal and I promise you won’t leave hungry. Click on the link below to print off your official invitation. Feel free to share it with those from your cities and departments who might have an interest in what we do. 11:00-12:00 Track Chipper demo - See a demonstration of a tracked chipper!